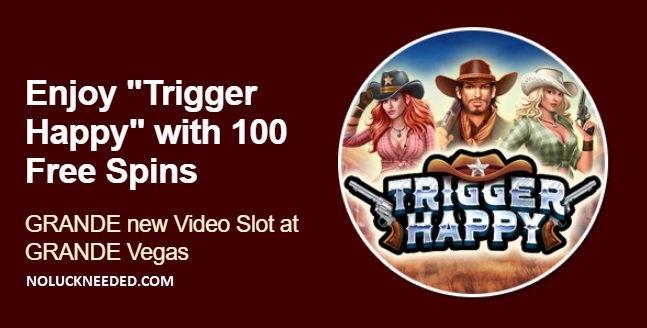 Spin the reels of a brand new slot machine called Trigger Happy with 50 free spins at Grande Vegas Casino! Redeem the coupon code TRIGGER-SPINS to claim your 50 Trigger Happy slot free spins if you have completed a deposit in the last 30 days and your account qualifies. You can also claim an additional 50 free spins and a 150% match bonus with the bonus code TRIGGER-TOP. Good luck! No max cashout! Go to the cashier's 'Redeem Coupon' section and enter the coupon code before you make a deposit! General Terms & Conditions apply. This bonus is valid until April 30th. Playthrough of your free spins is 10 times only. Play with Trigger Happy Free Spins at Grande Vegas Casino!